Guide members of the Pathfinder Society through exciting adventures and hone your skills as a leader at the table. Below are free downloads to expand your skills as a Roleplaying Guild Game Master, benefits to you as a GM, and supplements to add to the experience your game table. 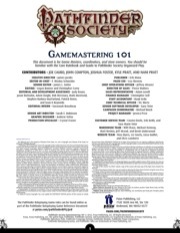 Divided into 4 lessons, GM 101 covers basic topics that will allow for new GMs to ease into the role of a Pathfinder Society Roleplaying Guild GM. Once you've mastered the basics, move onto GM 201 where you'll delves deeper into the more complicated aspects of gamemastery: using subtlety to build atmosphere, adding extra depth to roleplaying encounters, making effective use of props, dealing with troublemakers, and building a positive roleplaying community. The Pregenerated Characters package lets players take on the role of Pathfinder RPG iconic characters—great for new players and convention use. Each pregenerated character is provided at 1st-, 4th-, and 7th-level. Also available are the faction symbols, iconic character artwork, logos and other useful resource packages for you to use at your tables or to advertise your games and events. Get your character rolling! Pick up a fresh character sheet, catch up on the state of the Pathfinder Society Roleplaying Guild, and contribute to the on-going goals of your faction! Ready to move beyond the Beginner Box and take up the role of a Pathfinder Society agent? This guide provides a step-by-step walkthrough of the Pathfinder Society character creation process while referring you back to the Hero's Handbook, and allow for a seamless transition from the Beginner Box to Pathfinder Society play. The Faction Journal Cards a great way to contribute to your faction's goals while also being able to experience the fun of factions in any adventure—even sanctioned Modules and Adventure Paths. Each double-sided card includes a brief summary of the faction's aims, several unlockable rewards, and a wide variety of tasks the character can complete. The Story So Far includes summaries of major events of past seasons of the Pathfinder Society Roleplaying Guild without revealing spoilers found in individual scenarios.